The University of Pennsylvania ranking is 9th in the USA and 13th in the world on the University Review College Ranking List. It is ranked as the 8th best college in the states by the USnews, and the 12th best by Forbes. It is rated the 16th best in the world by the THE. The University of Pennsylvania tuition fees are $47,668 for both for in- and out of state students. It is an extremely selective college accepting 12.2% of applicants. Financial aid offered totals $179 million per year, an average of $41,961 per student. SAT scores for admission requirements (25th-75th percentile) are Math 690 – 780, Reading 660 – 750, and writing 670 – 770. The total composite SAT Score range for accepted applicants is 1360 to 1540. The requirements for ACT (25th-75th percentile) are Composite 30 – 34, English 30 – 35, Math 29 – 34, and Writing 8 – 10. The University of Pennsylvania, Philadelphia, PA was founded in 1740 having been proposed by Benjamin Franklin. It is a highly selective university and belongs to the ivy league, it typically only accepts around ~12% of its applicants. It is located in a campus of around 270 acres in western Philadelphia. University of Pennsylvania Photograph by Emil. There are around 10000 undergraduate students and approximately 9000 postgraduate scholars, in addition to the 4500 staff and faculty at the University of Pennsylvania. Penn has an endowment of 4.4 billion US dollars. The chancellor is Amy Gutmann. The schools mascots are known as Quakers. The libraries of Pennsylvania hold over 5.7 million bound volumes. It is a member of the Ivy League Schools. There are fifteen libraries that belong to the Penn system. In all the university has a collection of around 5.7 million volumes. Other colleges in the state include the University of Pittsburgh, Temple University, Carnegie Mellon University, Lehigh, Drexel University, the Thomas Jefferson University, and Penn State. PENN Motto – Leges sine moribus vanae (English: Laws without morals are useless). 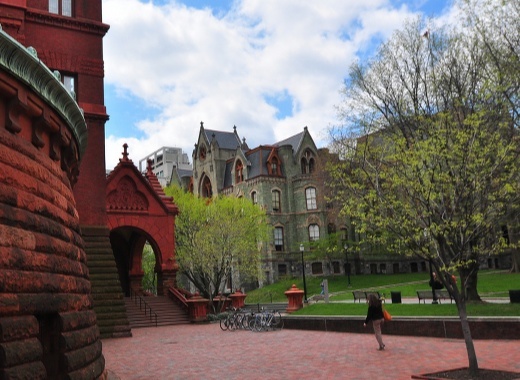 University of Pennsylvania; Pennsylvania Colleges List.